Tallahassee, the capital of Florida, is teeming with stunning art, incredible history, and astounding nature parks. The area’s charming environment serves as inspiration for many artists who perform and depict the society, background, and soul of the city. The unique combination of politics and ancient people groups is what creates the appealing culture of which Tallahassee locals are so proud. Though packed with history and heritage, the northwestern city also boasts high levels of humidity and abundant rain showers. Long, harsh summers and shorter, relatively cold winters characterize the subtropical climate. With temperatures reaching over one hundred degrees and incredibly amounts of annual rainfall, foundations in Tallahassee, Florida, regularly endure significant amounts of stress. The intense subtropical conditions in the area often cause problems such as foundation failure and sinkholes, and issues such as these can become incredibly dangerous and increasingly expensive if left unattended. However, Tallahassee residents have nothing to fear when they trust Solid Foundations to provide quality foundation repairs and sinkhole remediation services to their living and working structures. Foundations in Tallahassee, Florida, have to handle a lot. The magnitude of the temperatures, humidity, and rainfall produces a destructive combination of forces that can be very harmful to homes and businesses. A variety of structural problems may arise in the presence of such environmental factors, including mold, insect infestations, plumbing leaks, and condensation on pipes and insulation, all of which can induce long-term health and safety issues for Tallahassee residents. In addition to these complications, other dilemmas foundations specifically can face involve the cracking, shifting, or settling of the foundation. However, these dangers and more can be easily prevented and treated by the Tallahassee foundation repair services from Solid Foundations. In order to ensure that all potential problems are dealt with in a fast and efficient manner, Tallahassee home and business owners should always be on the look out for warning signs, such as cracks in the walls, floors, slabs, and drywall; water damage in the home; sloping or sagging floors; sticking doors and windows; leaning chimneys; stairways pulling away from the foundation; and even leaning homes. Whenever these signals of foundational trouble are detected, Tallahassee locals should contact the professionals at Solid Foundations immediately in order to receive a solution to their problem before it progresses to a more dangerous and dramatic stage. All of the piers in our Grip-Tite® piering systems come with a lifetime transferrable warranty, and our polyurethane resins and cement grouts supplied by Prime Resins® are top of the line. Therefore, these extremely reliable foundation repair tools are guaranteed to lift, level, and support your Tallahassee foundation so that you are no longer dependent upon the shaky and soluble limestone beneath Florida’s surface for structural support. With our Tallahassee foundation repair services, your Tallahassee home or business can obtain the quality foundation fix that only Solid Foundations can supply. If you noticed one or more of these sinkhole warning signs, take preventative action immediately by calling the professionals at Solid Foundations. With our Tallahassee sinkhole remediation services, Solid Foundations inspects the severity and causes of the situation before producing an effective fix for your sinkhole issue. Our geotechnical knowledge and extensive experience with sinkholes in the Tallahassee area enable us to quickly and expertly reestablish safety in the Tallahassee properties surrounding a sinkhole. 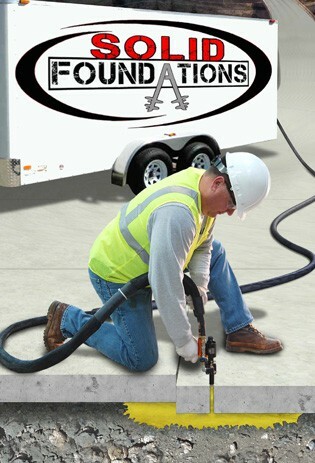 Solid Foundations serves the state of Florida with exceptional foundation repair and sinkhole remediation serves to hundreds of homes and businesses, but we offer many other foundational and structural services as well. Our crawl space repair services, slab lifting and leveling services, void filling services, pipe and structure leak repair services, soil stabilization services, and French drain installations are always available to Tallahassee locals who may need assistance with pressing structural situations around their homes or businesses, and no matter your problem, Solid Foundations has the fix you need. So contact us today for your Tallahassee, Florida, foundation repair services!